Fuzhou [China], Nov 8 (ANI): Ace Indian shuttlers Chirag Shetty and Satwiksairaj Rankireddy trounced Wahyu Nayaka and Ade Yusuf of Indonesia in straight sets of the ongoing China Open badminton tournament here. 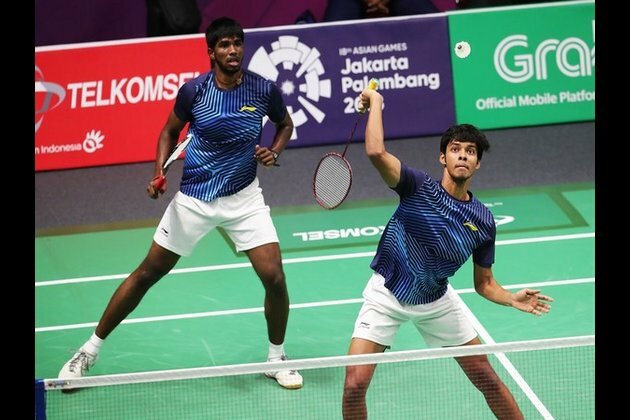 The Indian pair staged a scintillating comeback after losing a game to stun their Indonesian opponents 16-21, 21-14, 21-15 in the men's doubles pre-quarterfinals. Chirag and Satwiksairaj failed to find rhythm in the opening game, handing an easy advantage to Wahyu and Ade 16-21. As the game advanced, the match took a drastic turn in favour of the Indian duo. Th pair then dominated the exchanges and went onto dispose of their opponents 21-14 to take the match to the deciding round. In the crucial cliffhanger, the Indians while maintaining their momentum, showed the door to their Indonesian opponents 21-15 and won the match that lasted over an hour.